Mark your calendars for May 19, 2019. Don’t be left out! 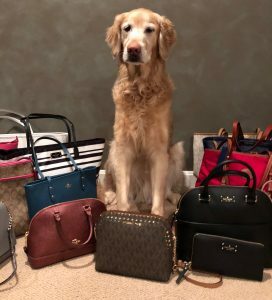 It’s time for Designer Bag Bingo… Sunday, May 19, 2019. Doors open at noon, bingo starts at 1pm! Tickets are limited, so get the scoop and your tickets today. Sponsorship opportunities available! Join us at the Reinholds Fire Company on Sunday, May 19, 2019 to support DVGRR by playing some bingo and winning fabulous designer bags ! Doors open at noon, bingo starts at 1:00 p.m. $25 dollars per person. Food is available for purchase, and there’s a bake sale table! Ticket amount is non-tax deductible. Bake Sale: Items for the Bake Sale Table can be dropped off at Golden Gateway (60 Vera Cruz Rd., Reinholds) on Friday, May 17th (8:00 a.m. to 4:00 p.m.) or brought to the event on Sunday, May 19th. We are seeking sponsors for the bags and baskets at this event to make it more profitable for the dogs in our care. If you would like to honor a human or furry friend or sponsor in memory of a loved one, please view our sponsorship opportunities. All sponsors are posted on our website and Facebook pages. Sponsors will also be announced at the event. Your sponsorship information will be displayed on our Facebook page and on our website as well as in the printed material at the event. Your sponsorship of $75.00 or more will be announced at the event. Questions? Contact Inza@dvgrr.org or call 717-484-4799. Mark Your Calendar, Get Your Ticket and Join Us!